Using the intelligent tester's data list allows switch, actuator and other item values to be read without removing any parts. Reading the data list early in troubleshooting is one way to save time. The key reminder warning buzzer sounds when the driver side door is opened while the ignition switch is in the lock or acc positions. 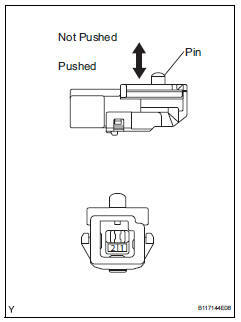 The key reminder warning buzzer is activated when the main body ecu sends a key switch signal and driver side courtesy switch signal to the combination meter. 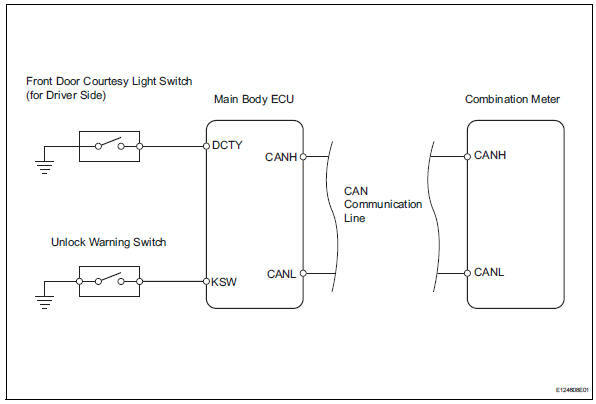 Hint: since the key reminder warning system has functions that use can communication, first confirm that there is no malfunction in the communication system by inspecting the can communication functions in accordance with the "how to proceed with troubleshooting" procedures. Then, conduct the following inspection procedure. Check the data list to ensure proper operation of the front door courtesy light switch. Ok: "on" (driver door is open) appears on the screen. 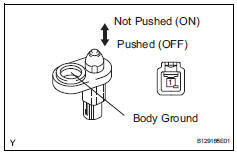 Check the data list to ensure proper operation of the door unlock warning switch. Ok: "on" (key is in ignition key cylinder) appears on the screen. 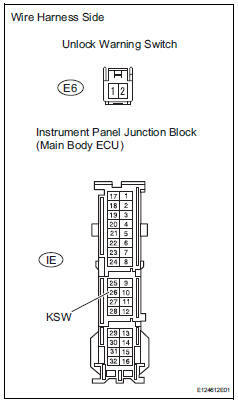 Measure the resistance between the wire harness side connectors. Remove the courtesy light switch.